Of all the Dutch winter vegetables, more Brussels sprouts have been exported in recent years. The export value of this vegetable has increased from EUR32 million in 2008 to EUR66 million in 2017. These sprouts are gaining popularity, especially in Germany, the United States and Italy. Brussels sprouts are the second most cultivated winter vegetable in the Netherlands. This first is carrots. This became evident in the preliminary results of Statistics Netherlands' (CBS) 2018 Agricultural Census. About two-thirds of the Brussels sprouts produced in the Netherlands are exported. The export of this vegetable to North America is small. However, it has increased in recent years. In total, in 2017, EUR3,6 million's worth of these sprouts were sent to North America. Of these, EUR2,8 million's worth was sold to the United States. Besides North America, it is mainly Germany (EUR32 million), the United Kingdom (EUR10 million), Belgium (EUR5 million), and Italy (EUR4 million) that are important export countries for Brussels sprouts from the Netherlands. A large proportion of almost all Dutch winter vegetables go to this country's eastern neighbors. 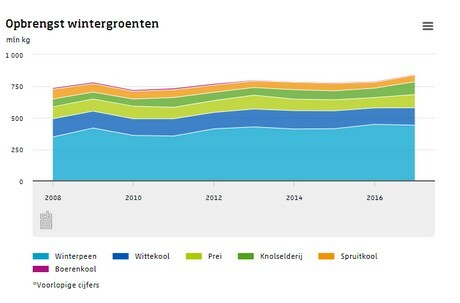 In 2018, winter vegetables were cultivated on 144.000 hectares of agricultural land in the Netherlands. Of this, 62.000 hectares were used for carrots. This is equal to 43% of the total acreage. This was followed by Brussels sprouts with 27.000 hectares (19%) and leeks (2.000 hectares or 14%). In total, in 2018, more than 1.650 farmers were growing winter vegetables. Of these, 850 cultivated carrots and 270 grew leeks. Two hundred businesses kept themselves busy with growing Brussels sprouts. 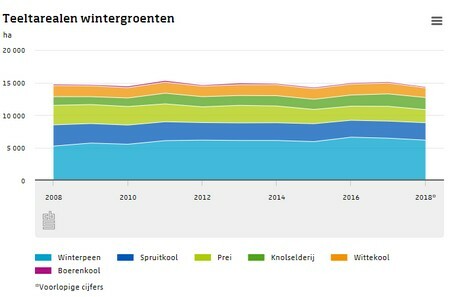 In 2018, the area used in the Netherlands for the cultivation of winter vegetables declined by more than 765 hectares. This is a decrease of five percent. Of all the winter vegetables, it is only the area used to grow Brussels sprouts that has increased. This increased by 2,1%. With 0,2&, the decline of the acreage used for kale was the lowest. That of white cabbage (11,4%) and leeks (12,2%) was the highest. 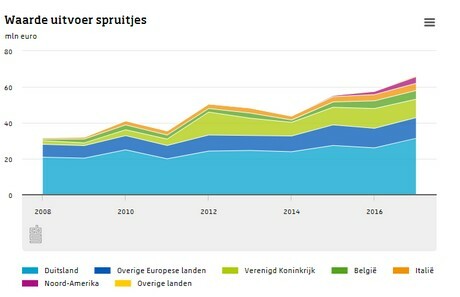 The acreage used to grown winter vegetables in the Netherlands was 3% smaller in 2018 than in 2008. Over this period, it was the acreage used to grow, specifically, celeriac that increase. This grew by 41%. Last year, carrots' acreage was 17% larger than in 2008. The biggest loss was with leeks (34%) and kale (19%). The area used to grow Brussel sprouts was 17% smaller in 2018 than ten years ago. In the Netherlands, in 2017, 847 million kgs of winter vegetables were harvested. With a yield of 444 million kgs, carrots are the most-harvested winter vegetable. This root vegetable is followed by white cabbage (138 million kg) and leeks (104 million kg). Compared to 2008, winter vegetables yields had increased by 14% in 2017. The yield per hectare of full soil vegetables are very dependent on circumstances. Despite this, the volume of celeriac increased by two-thirds between 2008 and 2017. That of carrots increased by more than a quarter in that same period. About a third fewer Brussels sprouts were harvested in that time.